There seems to be an endless number of factors that can affect freight class, and in our last two blog posts, we covered the most significant, including product category, materials, packaging, and density. When we talk freight class with our customers, many shippers ask about a potential or existing FAK (Freight All Kinds) rating, and whether it's getting them the best pricing possible. yes, we're throwing another shipping acronym in the mix. We'll take a look at what it is, which shippers quality, and whether or not it really is right for your business. 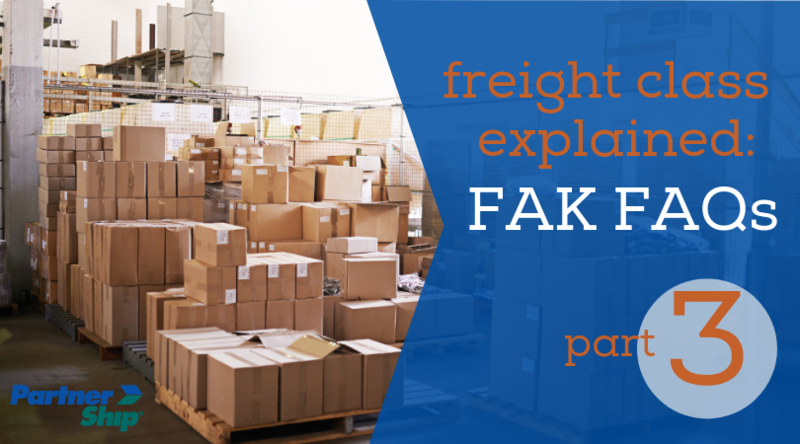 An FAK is a class agreement that is established between a carrier and a shipper, allowing the shipper to move multiple products of different classes at one standardized freight class. Essentially, an average class of all the commodities being shipped is determined, and the shipment gets rated at the same class regardless of the product type, making the price fair for both the carrier and the shipper. How does this differ from a class exception? A class exception agreement utilizes an umbrella system that may rate a range of actual class items at a lower class. For example, a business that may ship items classed at 70-200 may be rated at a class 150. Anything above class 200 would ship actual class. A true FAK is extremely rare for a shipper to negotiate with a carrier, as it requires extremely high volume for carriers to determine it worth their while. How does a carrier determine whether an FAK is possible? As mentioned above, freight carriers really have a lot of the control and are calling the shots in many parts of the freight industry. A shipper must really be moving a high volume of loads in relatively even amounts in order for lower-classed items to offset higher-classed items, making the compromise worthwhile to the carrier. Originally, when FAK classification agreements were first implemented, they were beneficial to both parties. However, many shippers learned how to manipulate the agreement, shipping risky freight loads at a lower cost, and putting carriers in the hot seat. To combat the misuse of the system, carriers have held back in entering these agreements more now than they used to. If you are a rockstar at optimizing the packaging and maneuverability of your high-class freight, taking into consideration density, fragility, and stowability, you have a better shot at obtaining an FAK. Basically, if you can get your freight to operate like a lower class, you may be rewarded with a lower class. If anything proves true in freight shipping, it's that nothing is as simple as it seems. An FAK can seem like an awesome idea with a few drawbacks, but even if a shipper does manage to acquire an FAK with a carrier, it doesn't mean it's exclusively beneficial. Keep in mind that carriers are in charge and the parameters in place are pretty much at their discretion. If you are not shipping lots of mixed pallet freight, it just doesn't make sense. Small to medium-sized businesses that have one or two major commodity types won't see the same benefits of an FAK as facilities that are mass producing many types of products would. If you are typically shipping lower-classed items, keep in mind that your "average" class could potentially be higher than your actual class, because you are essentially increasing your minimum charge. It may save you on the one-off shipment, but it's hurting you in the long run. The same goes for a class exception strategy. Carriers are not likely to be open to lumping any of your shipments of a higher class into this tier, no matter how infrequent they are. Because of this, your tired structure will likely reflect a higher average class, which is essentially over-classing your shipments. Another notable consequence of FAK implementation is that carriers will often limit liability on these shipments. In many carrier tariffs, verbiage is in place that the carrier is responsible for the price per pound on the freight class being paid. This is very different from actual class. If you are shipping a high value load at a very low class, even if the damage claim is won, the payout would be minimal compared to the value of the shipment. Now that we've gone over how an FAK can affect freight class, let's take a look at an example shipment that would create a difference for shippers with and without an FAK. We can use a hypothetical where we are a shipper with an FAK agreement in place. If the actual freight class of our shipment falls within 70-200, we are rated at 150. In this example we will be looking at a pallet of popped popcorn, in boxes, measuring 40 x 48 x 52 and weighing 315 lbs. This is a common shipment that would typically be rated as density-based, and would have a high class due to the fact its density is low. 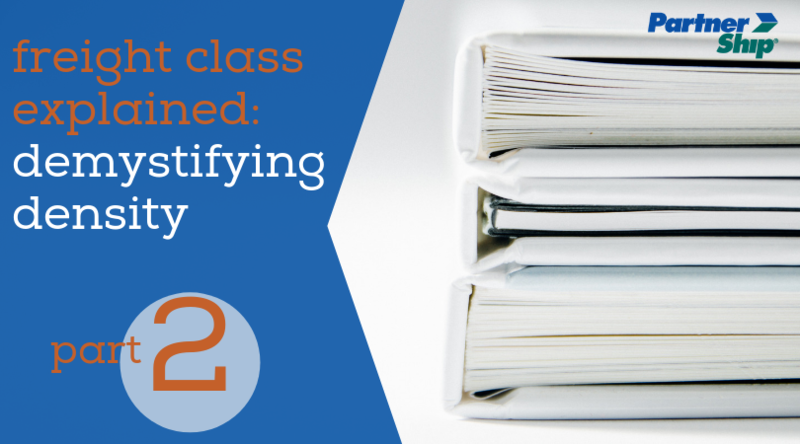 We will use ClassIT in order to determine the actual class and compare it versus the FAK. Once more, we have to figure out density. In this example, our shipment density is 5.75 lbs. per cubic foot. It fits under Sub 4, or class 175. This is a pretty high shipment class, and would result in a high freight rate. In our hypothetical example, our FAK would get this actual class 175 shipment rated at a class 150. Dropping to 150 isn't a huge difference for a final freight rate, but should anything happen to the shipment in transit, it could potentially pay out much less than what the actual class would. FAK is just another added layer to the very complicated topic of freight classes. While they may sound like a great alternative to paying actual class, it's pretty clear that with the current state of the freight shipping industry, carriers are dictating the terms for shippers. FAK agreements are rare, and it's likely they aren't the best option available to lower freight cost anyway. The most important thing for shippers to consider isn't an FAK or even a discount percentage - it's what you are paying for your freight. A qualified freight broker can help alleviate the stress of shopping rates, and make sure you are paying for freight at the class that's right for you. So, you've been brushing up on freight class and you're starting to get a hang of how it's determined. In the first part of our freight class series, we learned that packaging, commodity type, and dimensional features all influence the final code that ultimately affects your shipping price. Just when you thought you had a handle on the basics, we're going to throw you a little curveball. Some commodities have an added layer of mystery (and math) when it comes to their class: the density of the overall shipment. Let's sharpen some pencils and get down with density-based freight classifications. First thing's first, density is a method of measurement that relates the weight of your shipment to its dimensions, or pound per cubic foot. Typically, the higher the density, the lower the classification and vice versa. A good example of a high density shipment would be a pallet of bricks. Lower density shipments, or those that take up lots of space but are lightweight, are items such as ping-pong balls. Why are some shipments density-based and what are they? Commodities that are solid, heavy, and take up minimal space are very desirable to pretty much any freight carrier. Using density as a factor in determining freight class and pricing is becoming the new standard, especially as freight demand increases and capacity decreases. Thanks to variables such as a shortage of drivers and strict trucking legislation, carriers are trying to weed out difficult or unprofitable shipments in order to make space for more standardized loads. Time and effort are money in this industry, and carriers are taking control of who they want to ship for. How do you calculate the density of a shipment? Density is calculated by measuring the height, width, and the depth of the shipment, including skids and packaging. This is multiplied to determine cubic inches. If you have multiple pieces, multiply for each piece and add them together. Then, divide the total cubic inches by 1,728, or the total cubic inches in a foot. The result is the total cubic feet of the shipment's pieces. Divide the weight (in lbs.) of the shipment by the total cubic feet. The result is pounds per cubic foot, or density. You may also notice the "NOI" designation for this particular breakdown. "NOI" refers to "not otherwise indicated" and was implemented by the NMFTA for commodities that do not easily fit into existing classifications. Using NOI can be risky, since most products do have a specific freight class. Since "NOI" designations tend to draw attention from carrier inspection teams, it's critical that they are used properly, and that means density must be calculated to determine the subgroup. In this example, and using the formula listed above, we can determine density using its dimensions and weight. Multiply the length, width, and height (42 x 46 x42) to get the total cubic inches (81,444). Divide the total cubic inches by 1,728 to get the total cubic feet (47). Divide the weight of the shipment (500 lbs.) by the total cubic feet (47). This will give you a density of 10.65. Looking at the chart, we see that because of our crated packaging type, the top 4 subgroups are applicable. 10.65 falls under the subgroup 3, or class 92.5. In this class example, it is important that dimensions and weight are accurately measured in order to calculate the true density (and appropriate class) for the shipment. It's also crucial to note once more that packaging makes a huge impact. See how high the classes jump if the product is palletized or in packages other than secure crates or boxes. LTL services are in higher demand than ever before. National freight carriers are in the driver's seat, and doing what they can to limit troublesome shipments - including those with a low density and high freight class. Once you've optimized your shipments for carriers, many shippers wonder about whether a Freight All Kinds (FAK) agreement may be a worthwhile perk. Next, we'll take a look at what goes into that FAK and if it's right for your business. The freight specialists at PartnerShip can guide the way so you aren't stuck staring at your calculator, and a high freight bill. Call 800-599-2902 to speak with a representative, or get a quote today. Freight class is a critical component of shipping your LTL loads. But it's confusing and making a guesstimate is risky business. Your shipment's freight class plays a huge part in from everything from your initial freight rate estimate to your payout for any potential damage claims. How can a little number mean so much? Prior to understanding class number, shippers need to grasp the importance of the NMFC, or National Motor Freight Classification. Every type of product or commodity has a numeric code assigned to identify it within a categorical system, similar to a UPC used within a grocery store. The code also breaks down these products into over-arching groups, which then tell you how to class your product. 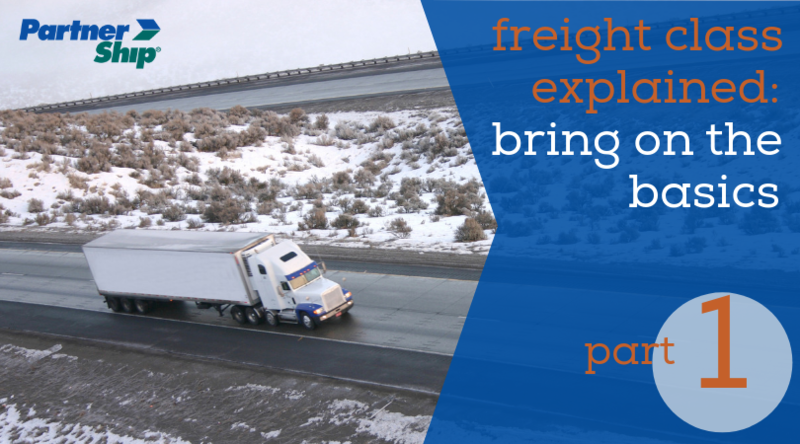 There are 18 freight classes that range from 50 to 500. Your freight class helps the carrier determine how much to charge for your shipment, along with other factors such as weight and distance traveled, as well as any additional requested services. Typically, the higher the class, the more expensive the subsequent freight rate. What factors determine a freight class? There are four factors that influence the classification of different commodities; each affects the difficulty in transporting the freight and increases the freight class. Density - The space an item takes up as it relates to weight. The higher the density, the lower the classification. Low density shipments take up a lot of space but weigh less, making the shipment unprofitable to carriers. More classifications are becoming density-based as capacity becomes crunched and larger, less standard types of freight are entering the network to be shipped. Storage/Stowability - This refers to how easily freight can be stored and stacked on the truck, and how much space it takes up. Similar to density, if a shipment is large, oddly-shaped, or difficult to fit in the truck, the load becomes undesirable. .A higher freight class is assigned in order to reflect the added work to fit in the load. Handling - Similar to storage and stowability, the more difficult it is to load and unload a shipment affects freight class. A shipment that requires more creativity and flexibility to load and unload will increase the class. Liability - Carriers assign higher freight classes to "high risk" shipments in order to limit their accountability for those shipments that are more likely to be damaged in transit or have an increased risk for freight theft. If you have high value or fragile products, it will be reflected in a higher freight class to offset that risk. To better understand the differences in freight classes, and how they are determined, looking at a few types of our most commonly shipped commodities can be insightful. As an example, we'll take a look at stone materials. While many shipments of stone are transported via truckload carrier, and don't need a classification listed on the shipping paperwork, there are still many instances where quarries, fabricators, and other stone suppliers need to move smaller loads for shorter distances. 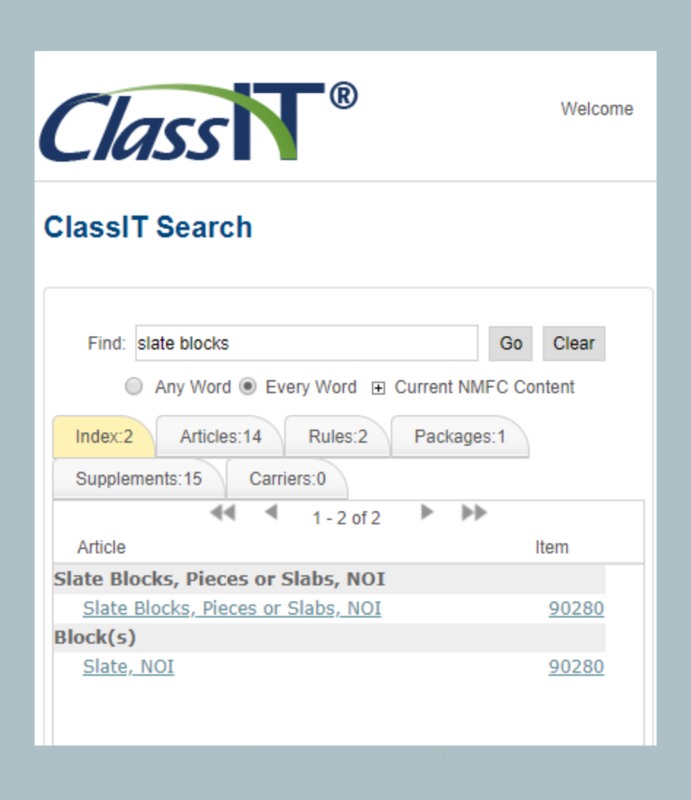 In order to help shippers determine freight class, the National Motor Freight Traffic Association has created an online reference tool, ClassIT. 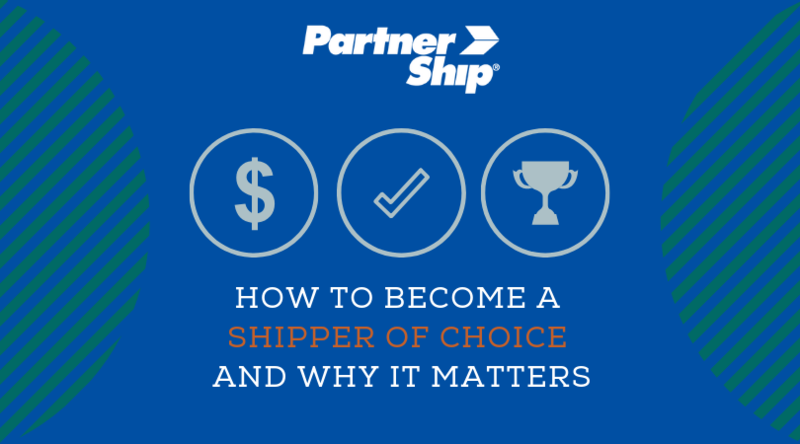 The resource is available to shippers with a membership, and it's the primary tool used by PartnerShip shipping specialists. The index can be searched by using a brief description of the commodity. Being too specific, or too vague, can create issues in your search results. Note you can search by including "any word" or "every word" to adjust your results. Let's say we have a shipment of slate blocks which are in 3 creates that are 4 ft. by 4 ft. and 515 lbs. each. We see two groupings that actually fall into the same Item or NMFC number, which is 90280. This is considered the "Gravel or Stone Group; consisting of gravel, sand, slag, slate, or stone, as described in items subject to this grouping." If we select "Slate Blocks, Pieces or Slabs, NOI" we are brought to the following breakdown of articles. You can see how specific it gets regarding packaging, usage, and dimensions. It goes even further than that, breaking down into subgroups which determine freight class depending on packaging and size. This is why it is imperative to know the precise weight and dimensions of your shipment. In our example, our slate blocks are in crates 48 in. long, which falls under the subgroup 4 - class 65. Compare that to crated slate blocks longer than 96 in., which would be class 85. This is an increase, but shouldn't affect pricing drastically. When packaging type is adjusted, however, the class is increased significantly. By palletizing the slate blocks (subgroup 1), freight class jumps to 250. At this weight, the final freight rate can be raised by hundreds of dollars. These details are notable, because it gives further direction on how best to package your freight for both safety and security. In 90282, the note states that "pieces or slabs 2 in. or less in thickness" must be boxed or crated and marked "fragile." We see more packaging direction in 90283 regarding exposed surfaces and edges and requirement for wrapping and other protection. This is to hopefully limit damage, but shippers must also be mindful that if freight falls within this category, and it is not packaged as directed, a damage claim will likely be denied by the carrier. Freight class, in addition to weight and distance traveled, is critical in determining a shipment rate. Specific details relating to product and packaging can greatly affect the NMFC code and final freight class. A shipment of slate blocks may sound simple enough, but things can get a bit more complicated once you start looking at different commodities. Density-based shipments can further befuddle shippers, and understanding these types of classifications is the next type of class breakdown we will tackle. The experts at PartnerShip can lend expertise so you can stop scratching your head. Call 800-599-2902 to speak with a representative, or find your freight class online.